We’d love your help. Let us know what’s wrong with this preview of A Search for Refuge by Kristi Ann Hunter. All N Margaretta Fortescue desperately needs to disappear from London society, and her only hope is to follow the rumors of another young woman who recently made a life for herself away from the glare of society. Her search leads her to the market town of Marlborough where, in spite of her efforts to avoid attention, she can’t seem to elude local solicitor, Nash Banfield. To ask other readers questions about A Search for Refuge, please sign up. Una historia corta muy dulce que da inicio a la nueva serie de Kriti Ann Hunter. En este relato conocemos a las dos protagonistas de los siguientes dos libres mientras la autora nos cuenta la historia de Margaretta, una joven que llega a Marlborough huyendo e intentando ocultar un enorme secreto, y Nash, un abogado de un remoto pueblecito que tras un suceso duro de su pasado se ha aislado de todo y todos. El relato consta de diez capítulos bien estructurados en los cuales se va desentrañando el Una historia corta muy dulce que da inicio a la nueva serie de Kriti Ann Hunter. En este relato conocemos a las dos protagonistas de los siguientes dos libres mientras la autora nos cuenta la historia de Margaretta, una joven que llega a Marlborough huyendo e intentando ocultar un enorme secreto, y Nash, un abogado de un remoto pueblecito que tras un suceso duro de su pasado se ha aislado de todo y todos. El relato consta de diez capítulos bien estructurados en los cuales se va desentrañando el misterio que envuelve a Margaretta y como ella y Nash se van uniendo durante ese proceso. En este relato he echado a faltar esas notas de humor que tanto me gustaron en "Por fin en Marshington Abbey", pero comprendo que el tema que se trata y la situación de ambos protagonistas (y también de los personajes secundarios) no daba pie al humor. Quizás el único persona que rompe un poco la tensión del relato sea la señora Lancaster. Me he quedado con ganas de saber mucho más sobre este último personaje y sobre Margaretta y Nash, espero de corazón que en los libros siguientes tengan algún papel y nos cuenten que es de ellos. I feel like this story may have done better as a full-fledged novel, because the plot seems pretty interesting and something that I would enjoy reading. However, while I liked it well enough at first, the more I got into it the more I just couldn’t get into it. I didn’t really feel invested into the two main characters so their romance really did nothing for me. I don’t know. There are some historical inaccuracies that bother me a little, as well; little things such as language and manners. I want I feel like this story may have done better as a full-fledged novel, because the plot seems pretty interesting and something that I would enjoy reading. Some parts were confusing to try to read through, but overall this was a really enjoyable little story. Nash and Margaretta were an interesting couple and made a sweet pair in the end. I liked the exchange Nash and Mr. Fortescue had...also I'm looking forward to Katherine's story this summer. Newly widowed Margaretta needs to escape from her late husband's brother. Traveling round-about routes to throw off anyone who might be following, and with only a modest amount of money, she takes mail coaches as far away from London as she can. The first woman she befriends, and my favorite character, Mrs. Lancaster, offers her a room above her store. But what Margaretta really wants is to find Katherine, a woman who also went into hiding, believing Katherine can help her with her predicament. Newly widowed Margaretta needs to escape from her late husband's brother. Traveling round-about routes to throw off anyone who might be following, and with only a modest amount of money, she takes mail coaches as far away from London as she can. The first woman she befriends, and my favorite character, Mrs. Lancaster, offers her a room above her store. But what Margaretta really wants is to find Katherine, a woman who also went into hiding, believing Katherine can help her with her predicament. The town solicitor, Nash, makes no bones about suspecting this new comer of ill-motives, and keeps his eye on her. As he observes and spends time with her, he realizes she may not be what she portrays, but she's not out to hurt Mrs Lancaster or anyone else. The day comes that two men from her past turn up in town, and Nash feels deeply the need to help her, to protect her from what she's never said she's running from. Fairly nice story, but could use a bit more development. Feelings change too rapidly without enough storyline to justify it. Someone's feelings about children (a huge issue in this person's mind) literally change overnight. The novella size makes it a bit difficult for proper story detail, unfortunately. I love the premise behind this new series: Haven Manor—a place for young women who find themselves in ‘a delicate situation’, as they might say, where they can escape the scorn of society and receive the support they need. This novella is set about ten years before the first full-length novel in the series takes place (due to release 5 June 2018) and tells the story of how Haven Manor comes to be. There’s a little bit of intrigue, and I enjoyed the development of Margaretta and Nash’s friendship I love the premise behind this new series: Haven Manor—a place for young women who find themselves in ‘a delicate situation’, as they might say, where they can escape the scorn of society and receive the support they need. This novella is set about ten years before the first full-length novel in the series takes place (due to release 5 June 2018) and tells the story of how Haven Manor comes to be. There’s a little bit of intrigue, and I enjoyed the development of Margaretta and Nash’s friendship. I thought Nash’s ‘problem’ was perhaps a little simplistic, and there were a few instances of Americanisms/anachronistic language that threw me out momentarily (I can’t remember them precisely since Kindle saw fit to somehow discard ALL my highlights) but overall, it was a quick and enjoyable read. Moral Note: Mild talk of pregnancy outside of marriage. A Search For Refuge is another delightful tale from Kristi Ann Hunter. In 1804 England, Margaretta is fleeing for her life and trying to find her friend Katherine, who disappeared under questionable circumstances. Can she find the answers and refuge in Marlborough? Are Mrs Lancaster, a local shopkeeper, and Nash Banfield, a solicitor, people she can trust or will they reveal her whereabouts to her father and unscrupulous brother-in-law? Margaretta is out of her element. Having grown up in wealth A Search For Refuge is another delightful tale from Kristi Ann Hunter. In 1804 England, Margaretta is fleeing for her life and trying to find her friend Katherine, who disappeared under questionable circumstances. Can she find the answers and refuge in Marlborough? Are Mrs Lancaster, a local shopkeeper, and Nash Banfield, a solicitor, people she can trust or will they reveal her whereabouts to her father and unscrupulous brother-in-law? Margaretta is out of her element. Having grown up in wealth and comfort, she now has to fend for herself. Will Nash be the one to help her and get to the bottom of who she is running from and who she is trying to protect? This is a very well-rounded novella, providing intrigue in a historical English setting. Kristi always portrays interesting, believable characters. The faith element is very natural to the story, giving depth and insight. I can’t wait for the next full length novel! A novella. Under 100 pages, so it was a quick read. Sweet little story. Enjoyable read. Only downloaded it on a fluke, but really glad I did. I can easily recommend this novel. And, I'm thinking about continuing in this series. I enjoyed the beginning, but the love story was pretty weak. MC is a Mary Sue and very much the damsel in distress. The hero, Nash, had a pretty flimsy reason (IMO) for avoiding relationships and children. I might be more sympathetic if it was his own wife who died in childbirth, the baby soon after, but it was his brother’s wife and child. Nash’s bro got super depressed and said the worst part was that he was responsible. He had caused her death by making love to his wife and getting her with ch I enjoyed the beginning, but the love story was pretty weak. MC is a Mary Sue and very much the damsel in distress. The hero, Nash, had a pretty flimsy reason (IMO) for avoiding relationships and children. I might be more sympathetic if it was his own wife who died in childbirth, the baby soon after, but it was his brother’s wife and child. Nash’s bro got super depressed and said the worst part was that he was responsible. He had caused her death by making love to his wife and getting her with child. The funny thing is that Bro pulled himself out of his despair, remarried, and is happy with his second wife and children. NASH is so traumatized by Bro’s experience that he gets nervous around children, especially babies. A baby means that a woman was very recently at death’s door. Puh-Leez Nash! It’s called the circle of life. Go watch The Lion King. Excited for the new series from Kristi Ann Hunter, and this novella intro was a nice big step into the location and storyline. My major issues with the book, really stem from the fact that its a short story, which provides so many limits that, had this been a full novel, based on what I have read in the past by this author would have ironed out all of those details. At times, it gets a little confusing. We are introduced also to Nash's really big difficulties with marriage and family. His reason Excited for the new series from Kristi Ann Hunter, and this novella intro was a nice big step into the location and storyline. My major issues with the book, really stem from the fact that its a short story, which provides so many limits that, had this been a full novel, based on what I have read in the past by this author would have ironed out all of those details. At times, it gets a little confusing. We are introduced also to Nash's really big difficulties with marriage and family. His reasons are crystal clear, and the reader can genuinely accept his stance. With that, also comes the sudden change in emotion. Its fair to say that Nash has had time to get to know Margaretta - the resolution to her plight and his feelings changing and suddenly overcoming all his fears seem a little too hurried. The dialogue/interchange between Nash, Mr Fortescue & Samuel Albany is clever, and was a great way to put off the real threat that is being posed, at least for a time - enabling Nash to step in and act. It wasn't clear where her father stood, until that last interaction in the office, and it was a good one.
" . . .worries belonged to the Lord since He stayed up all night anyway." The Lord only knew how many worries Margaretta carried under the hood of her bright yellow cloak when she stepped off the mail carriage in Malborough, England. Following the trail of a months old letter from a dear friend, she found herself in Lancaster's store, nearly begging for food and dodging questions from a tall, dark and handsome local solicitor. Nash Banfield's keen instincts told him that "traveling alone, travelin " . . .worries belonged to the Lord since He stayed up all night anyway." Nash Banfield's keen instincts told him that "traveling alone, traveling light, and hiding her face", meant that the young woman who had just stepped into his town was running away from something . . or someone. Determined curiosity and a deep affection for Mrs. Lancaster propelled Nash forward, anxious to make sure the kindhearted storekeeper was not duped by a pretty face and a sad tale. However, neither of them was prepared for the challenges that one simple introduction would require. 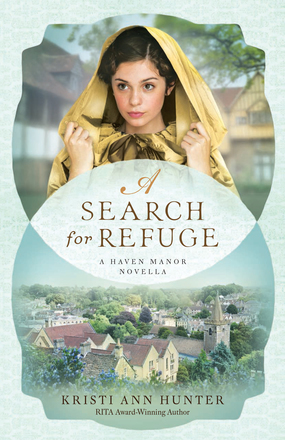 A Search for Refuge (2018) by Kristi Ann Hunter is the first story in her soon-to-release series, Haven Manor. This novella was just released this past Tuesday, March 6, 2018, by Bethany House Publishers. This novella comes in eBook format, and is 129 pages in length. With a full-time job and a very busy five-year old at home, this story took me two days to devour! Currently, this novella is free through Amazon, Barnes and Noble, and CBD. 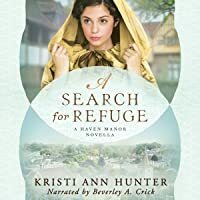 I downloaded a copy to read and review from Amazon on Mar A Search for Refuge (2018) by Kristi Ann Hunter is the first story in her soon-to-release series, Haven Manor. This novella was just released this past Tuesday, March 6, 2018, by Bethany House Publishers. This novella comes in eBook format, and is 129 pages in length. With a full-time job and a very busy five-year old at home, this story took me two days to devour! Currently, this novella is free through Amazon, Barnes and Noble, and CBD. I downloaded a copy to read and review from Amazon on March 6, 2018. The opinions expressed in this review are my own. I give A Search for Refuge 5 STARS. This story is a Christian Historical Romance. I love Kristi Ann Hunter’s novels. She is such a masterful storyteller. She creates wonderful worlds, engaging and deep characters, and her sense of wit and humor is excellent. I will read anything she writes. So, when I heard A Search for Refuge had released, I had to make room in my review schedule to read this book immediately! Boy, am I glad I did. I love Margaretta and Nash’s story, and I cannot wait for the next book, A Defense of Honor, to release in June! I fear it’s going to be a long wait. Nash is an excellently written hero, and my favorite part of the book. He is handsome, of course, but he is way more than that. He is kind and compassionate, and he cares so deeply that tragedies hurt him a little more than the average fellow. Nash has a big heart for the people in his community, especially for Mrs. Lancaster, an elderly widow (who is a total hoot, and I can’t wait to see her again in A Defense of Honor), but he holds everyone at arm’s length. A few years prior to the start of this story, Nash lost his sister. The pain he felt, and the pain he witnessed from his sister’s husband, made Nash vow to keep people out. He would not allow a deep connection with anyone, especially a woman he could potentially fall in love with. I appreciate this very realistic aspect to Nash’s character. I get this need to protect one’s self from pain. Why make such a deep connection with someone when it’s quite possible to lose them? How could anyone ever get over the hurt and the pain of such deep loss? Ten years ago, I was with a very close friend on the day she was told her son had been killed in a horrific train crash. The conductor of the train had been on his cell phone and didn’t see the yellow light and two red lights telling him another train had right of way. It was a terrible crash that took the lives of many innocent passengers, and it all could have been prevented if one person was paying attention. I will never forget the empty look, the tears streaming down my friend’s face, the absolute terror she exuded as the cop relayed that she would never see her child ever again. I remember thinking that 18 years is not enough time to have with your child. And, I remember a deep sense of fear settling in the pit of my stomach. How could I ever put myself into a position where one day a cop could tell me a loved one has been lost? That day, I felt the walls to my heart close up. I was determined to not let anyone in. I was going to “protect” myself if it was the last thing I did. I will not lie. My friend will never be the same, and for the first two years after her son’s death, I worried for her and her husband’s health. Things were not good. BUT, time passed. My friend and her husband will miss their child every day. How could they not? But life keeps going. Today, my friend smiles, she laughs, and she loves. She has three grand babies who bring her such joy that she lights up when she talks about them. She found purpose in the foundation she and her husband created as a way to teach people the importance of cellphone-free driving. My friend survived by allowing her heart to hurt, then heal, then thrive. I have learned a great lesson from my friend. There is an order to grief. Tragedies happen and they are awful. People have to allow time to grieve and hurt. But, they also have to allow time to heal so they can get back to living. People cannot stay in the grief-and-hurt-and-fear mode. If they do, they will live paralyzed lives. They will be like Nash — lonely and separate. This is not a lifestyle God desires for us to have. God wants us to love and live and experience and grow. Over the course of A Search for Refuge, Nash realizes that a life lived without love is not a life being lived, it’s a life being wasted. After making this revelation, Nash smiles to himself and feels free. He is free from the fear of potentially losing someone, and allows joy into his life. He finally claims the life God wants him to live. And, this reminder — that I need to live the life God gave me with joy and love and hugs and kisses — is the absolute best part of the book. I did learn from my friend’s example. I opened my heart to life. I did fall for my husband, and we have a wonderful blessing in our lives — our beautiful daughter, Miss Isabella. I cannot imagine my life without my husband and daughter. Yes, I could lose them to an accident or sickness, but to not have had them in my life would have been even more of a loss. I am choosing God’s path for me rather than the fear that I experienced that day ten years ago when my friend lost her child. This choice to follow God’s path, and not my fear, has made my life more meaningful, and I feel a joy that is beyond anything I could have imagined for myself. God is SO good! I loved this sample of Kristi Ann Hunters new series. I'm glad that there is more coming because I hated putting this one down. What would you do to protect yourself and loved ones when danger loomed? I'm sure that there were many instances of unwed young mothers in history and the desperate measures they had to take for survival. This book opens up what I hope was a possibility for some of them and I can't wait to read more. This book has made me excited to read the new full length book for this series by Kristi Ann Hunter. The characters are facing some trials and need faith, love, friends, etc to help them get through it. I "purchased" a copy for Free on my Kindle. Margaretta Fortescue arrives tired and dusty in Marlborough after 3 days of changing mail coaches to try and escape danger. She heads for a small grocer to ease her grumbling stomach, only to meet with Mrs. Lancaster who is the friendly and chatty proprietor. Little does she know she has been followed by the local solicitor, Mr. Nash Banfield who has promised to look after the elderly widow and ensure no damsels in distress or worse, take advantage of Mrs. Lancaster. However, Mrs. Lancaster has her own ideas and regularly makes herself available for helping those in need in accordance with God’s will. Ms. Hunter kicks off her Haven Manor series with a free e-novella, A Search for Refuge. Margaretta Fortescue finds herself running from her previous life to the small town of Marlborough. She hopes to discover a solution to her current predicament through the wisdom of an old friend, who also seemed to disappear from London society along a similar route. Along the way, Margaretta is taken under the wing of one of the town’s elderly widows and her neighbor, solicitor Nash Banfield. While Nash has no intention of becoming emotionally connected to anyone after the tragic loss of his sister, he soon finds himself drawn to Margaretta and her situation. Together, Margaretta and Nash discover the truth of her friend’s condition and become determined to risk everything on a solution to all of their problems. While remaining in Ms. Hunter’s Regency era world, A Search for Refuge offers readers a different perspective on the period. With a quieter setting, her characters still show an incredible spirit and determination that will make readers recognize them as being distinctly those created by Ms. Hunter. Overall, I really enjoyed reading A Search for Refuge! In reading this story, I found it to be slightly more sedated and less humorous than Ms. Hunter’s previous novels. While this calmer approach seems appropriate to this particular tale, Ms. Hunter returns to her full effect in the rest of the series, as evidenced in the sneak peak for A Defense of Honor, which is also included in this e-novella. Ms. Hunter continues to engage her readers in a interesting cast of characters and intriguing settings of the Regency Era. Yet, she brings a new set of circumstances that make for compelling storylines and fascinating directions for her characters’ development. By the end of this novella and the novel excerpt, I couldn’t wait to read the first full novel of the Haven Manor series! PS. To see the full review, please visit http://booksandbiscuits.com/blog/2018.... Thanks!